Product Listing 1 and 3 & Offer Box 2 are BuyBox blocks that interacts with your store's Products section. Using these blocks, you can add a store product and it will pull in the product information into the block's elements: Image, Description, Price, and Availability. You're able to edit the product's Description just like any other Text element as well as the Button's text and destination. The first step is to choose the product for the block using the green pencil icon in the top-right corner or by clicking on any element within the block. For your convenience, there's a Live search input field - just start typing product title and it will filter your products for you. Once your product is selected, it will pre-populate the product information into the block's elements: Image, Description, Price, and Availability. You can set a "Compare at price" value through Shopify and it will display this price crossed-out to the left of the actual price on the published page. To select several variants you need to push and hold the CTRL key on your keyboard (CMD on Mac) while selecting the variants with the left-click button of your mouse. NOTE: If you add a new variant for the selected product through your Shopify admin panel, it automatically becomes available and selected in the product element. So, keep that in mind so that you can edit this block and exclude the additional variant(s) if you don't want it shown. Don't forget to click the Publish/Update button to apply this change to the actual page. If either the "Cart" or "Checkout" destinations are chosen, there is an option to display a Quantity Field so your customers can add a quantity greater than one. Set the Default Product Quantity which presets the quantity for the product to the number of units specified. 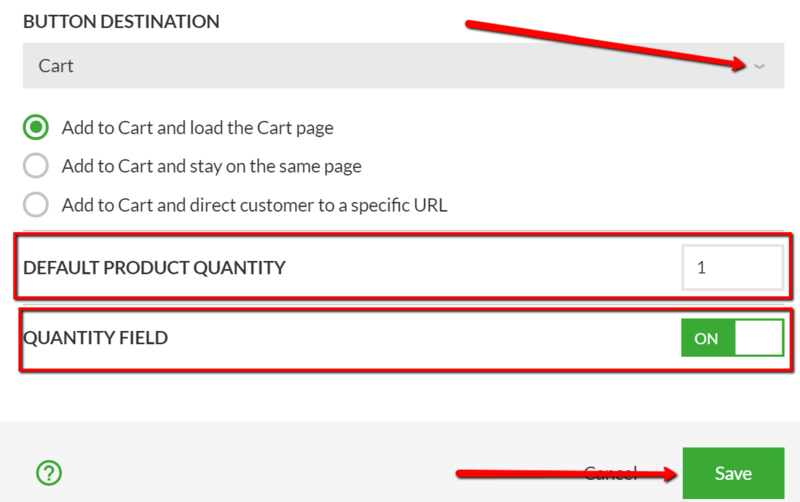 With this option you can not only set the default value for the quantity selector, but you can also hide the quantity selector if desired so that the page visitor has no way to change the product quantity to something else before adding the product to the Cart or Checkout. Use this option for apps like Quantity Breaks by Bold or to offer multi-pack bundles of the same product for example. Variant Image - sets the BuyBox to display the variant's image on page load. If more than one product variant is chosen, the image for the very first variant which is pre-selected will show. Product Image - sets the BuyBox to display the default product image which is set for the product in Shopify. Note: When in the Page Builder and Preview mode, it will display the Product Image by default in the BuyBoxes, but will display the variant image on the actual published page if the variant image option is chosen. The "Offer Box 2" block is specifically designed to offer a discount to your customers via a coupon code specified at the bottom of the block. 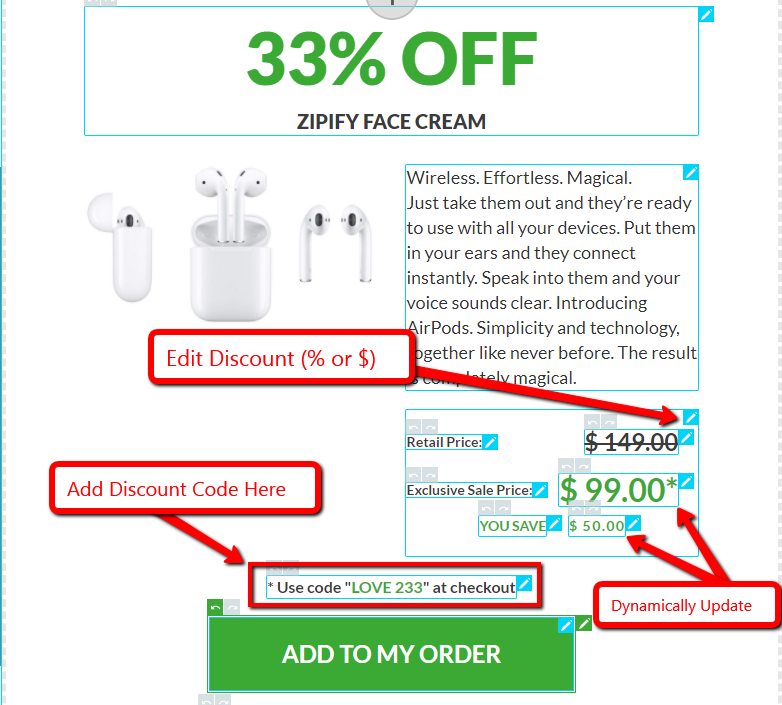 With Offer Box 2, there is an element to enter a % or $ discount for the product. When entered, the "Exclusive Sale Price" and "You Save" prices will dynamically update based on the discount set by you. Make sure to include the Shopify Discount code you've created in the "*Use code" field so that your customers can use it to obtain the advertised price at checkout.